The current free market system and the existing legal system block the free development of our culture. In order to change this, McKenzie Wark, author of A Hacker Manifesto, argues for a shift from a commercial economy to a gift economy, where the focus is on social relations rather than on profit. Cover ‘A Hacker Manifesto’, 2004. Any work – of art, of writing – in any media, if it is in the least bit interesting, becomes at some point an adventure. Usually, the adventure happens in the making, before the work is finished. ‘The work is the death mask of its conception’, says Walter Benjamin. But sometimes the adventure begins, or continues, after the work is finished, reanimating it with fresh problems. That’s what happened to me. I wrote a book once about intellectual property. Basically, I am against it. As I wrote in this book, called A Hacker Manifesto: ‘Information wants to be free but is everywhere in chains.’ The digital – an age-old property of information – is an idea whose time has finally come. The relation between digitally encoded information and the material in which you find it – the page, the screen, the disc, the drive – is now perfectly arbitrary. Pretty much the same information could be on this page or that disc or that website. A weird ontological property of information, something in its very being, is now fully active in the world – and causing all kinds of trouble. Not least for authors. Not least for me. On the one side, a vast social movement has arisen that intuits the significance of digital information as a social fact. In its more public and self-conscious forms, this social movement includes Creative Commons, the Open Source and Free Software Movement. But this is just the tip of the iceberg. Submerged out of sight is a vast culture of file sharing, whether using torrents or plain old CDs passed from hand to hand. This private, pervasive new economy – a gift economy in which the artefact is nothing and its digital information everything – might be an even more significant part of this social movement than its more publicly declared aspects. On the other side are the entrenched interests of the corporate world which, particularly in the ‘overdeveloped’ rely more and more on their portfolios of trademarks, patents, copyrights and on trade secret law to stay in business. In A Hacker Manifesto I argue that these corporations are the legal expression of a new kind of class interest. No longer a capitalist class, but a vectoralist class. The key to their power is not physical capital such as factories and warehouses, but rather vectors through which it controls information such as the logistics of the supply chain, and the brands, patents and copyrights under which the company’s wealth of information is protected. The vectoralist class only incidentally sells things. It sells images, ideas, data, strapped willy-nilly onto things you can buy, from T-shirts to dvds, from pills to iPods. Caught between the social movement of free culture and the corporate interests of this vectoralist class are what I called the hacker class. Not just computer hackers, but anyone who makes new information, whether as a scientist or artist or writer or musician. This hacker class, this creative cohort, has interests that are really closer to the social movement for free culture and the new gift economies it is spontaneously creating. Intellectual property presents itself as being about the interests of the ‘creator’, but it is really about the interests of the ‘owner’. In practice, making a work of music or art or a new drug is not something you can do on your own. You need help from the owners of the vectors along which it might be distributed. So you end up selling your rights as a creator to those who own the means of realizing its value – the vectoralist class. So I wrote a book about this, A Hacker Manifesto, and found myself in exactly this situation. A book is just a personal diary unless someone else reads it, but getting other people to read it is not easy. Of course I put versions of it as a work in progress out on the Internet, particularly via the nettime.org mailing list. It was discussed, derided, dismissed, but also reposted, put up on websites, and so on. It still leads an underground existence, as one of those texts with which people in the net art and theory world may have some glancing acquaintance. It got me invited places. I travelled the world with it. There were ‘amateur’ (and good) translations in Spanish and French. It was, on a tiny scale, the new gift economy in action. Make something, give it away, let people find it and do what they want with it, and sooner or later someone will return the gift. Someone will offer something back, even if it is just their own time and attention to what you made. There isn’t anything particularly noble or self-sacrificing about this gift economy. It doesn’t rely on anyone being a saint. It’s just about using the strange ontological properties of the digital to enable new ways of producing social relations out of human vanity. Everyone who makes something, an artwork, a song, a text, wants people to pay attention to them. One way to get people to pay attention is to give them your work. Like any gift it gives with it an obligation – in this case very slight – to treat the gift as something other than just a thing, as just stuff. What digital technology makes possible is a vast outpouring of the gift. Now everyone has a blog that can be read by anybody, only there’s nobody there to read it. Everybody is too busy writing their own blog. So out of this vast excrescence of the free, new gift economies emerge. Bloggers post comments on each other’s blogs. They add each other to their blog rolls. They do group blogs. Little communities of attention form. It was exactly like this in the listserver world in the ’90s (and before that on The Well and Bulletin Board communities.) Things being free isn’t enough. It is also about making social relations that bind people with a weak but widespread obligation to treat what each other does as more than just objects, more than just stuff. It’s about thinking of oneself as something besides a consumer. This is the social core of the social movement around free information. It’s not really about technology, although that is a part of it. Nor is it really about law. Lawyers such as Lawrence Lessig made important contributions to the movement, but the fundamental questions are not legal. It’s about new kinds of social relations. It is about the very possibility of social relations. It’s hard not to be a consumer. It’s what we are most of the time. There’s work, where we earn the money, and there’s non-work, where we spend the money. Most of our time is spent either servicing others as consumers or being serviced as consumers. In its vectoralist form, commodity culture has evolved a sophisticated way of treating us as its consumers. It’s all about crafting an image and a brand for a commodity that makes it appear as something more than a mere thing. The thing – be it a T-shirt or a carton of orange juice – is the support for an experience, mediated by a brand and an image that makes us feel special, that makes us feel unique. The constellation of brands with which I surround myself may not make me unique, but they do make me rare. The brand is rarefying. The shoes I am wearing right now are a brand called Roos. They would not be special to the sneaker fan, but they are to me. Their logo is a kangaroo, and being from Australia I feel some vague affinity with these shoes. I may not be the only man who wears them, but I am probably one of a very few Australian men who wears them, and quite possibly the only Australian man who wears them in pink. As with shoes, so with books. I’m more of a book shopper than a shoe shopper. I’ll make do with slightly interesting shoes, but will go out of my way to buy rare and exotic books and display them on my shelves, and even sometimes read them. People who make a fetish of their books know, just like shoe fans know, that it makes a difference whose brand is on it. If it is published by Verso or Semiotext(e), I’m much more likely to check it out. Like any shoe fan, I am aware of how gentrification works with my chosen products. Things pioneered by the smaller, cooler publishers get picked up and mass marketed by Routledge or Continuum. So here was my dilemma: I wrote a book against intellectual property, and yet to get people to read it, to get it beyond a certain level, I needed a publisher – and a brand name publisher at that. You can get a text read if you give it away freely, particularly if you are a dedicated participant in a gift economy. If you are paying attention to other people’s texts, then some of those people will pay attention to yours. But most people still define value in culture through the commodity. If its not branded and marketed, how can it really have any value? So I sent A Hacker Manifesto to half a dozen publishers, all of whom turned it down. Sadly, two of my personal favourites, Verso and Semiotext(e), passed on it. Thus putting an end to every writer’s dream of becoming the very brand we most like to consume. The publisher who said yes was Harvard University Press. I sent the manuscript off to Lindsay Waters, executive editor, and a week later he phoned. Lindsay had been an editor at the third of my favourite publishers – University of Minnesota Press – when it published a terrific series called ‘Theory and History of Literature’. At Minnesota Lindsay published Bataille, Lyotard, Deleuze, Guattari, Jameson. At Harvard he publishes Benjamin, Spivak, Hardt and Negri. Without kidding myself that I belonged on that list, I was nevertheless chuffed to be in such capable hands. One problem: Harvard would not release the book under the Creative Commons license. Just wouldn’t budge on this issue. So what was I to do? Frankly, I have never thought Creative Commons was the key to the movement. It’s a useful tool, or set of tools, just like its predecessor, the General Public License. But I don’t think the social movement is really about law. It’s about creating new social relations. This was just a hunch at this point. I wouldn’t get a chance to think it through until after the book came out. At this point I just thought: publish and be damned. I had a great time working with Harvard. I gave a talk to their staff. I gave another talk to their sales reps. That was a harder crowd to please, but we bonded over love of obscure bookstores. We agreed that the book itself had to be a thing of beauty, a desirable object. Designer Tim Jones gave it a classical look, as though it were not some flashy, fashionable extrusion of Internet culture, but something else. Something untimely. It had to be well designed, to give people a reason to want it as a thing, even when the ideas in it were all available free on the Internet. The – now rare – first editions even came with a luscious clear plastic dust jacket. It sold pretty well. It got reviewed. I was invited more places. But now this was a different thing. I was no longer a member of a gift economy of squabbling but somehow like-minded Internet theorists, artists and activists. I was the author of a book. It wasn’t my first book, so it wasn’t so strange. But it was the first time I had really thought about the difference between the gift economy of the net and the commodity culture of publishing. In the world I came to know through nettime, nobody was selling anything. There were definitely ‘hierarchies’, but these had more to do with who you could rely on to really pay attention to something. You figure out after a while who can give and receive the gift of attention. Everybody who posts to a listserver wants attention, but not everybody knows how to give it. Interestingly, not everyone knows how to receive it, either. A gift economy is a perennial work in progress, as astute readers of Bataille or Baudrillard might have expected. But being on a book tour posed something of a dilemma. A Hacker Manifesto argued that there is something inherently limiting about treating art or writing as property. And yet there I was, hawking it as property. ‘Live the contradictions!’ I told people. Rather than trying to be pure of heart and moral of character, it’s more interesting to explore exactly why it isn’t possible to lead a just life in an unjust world. ‘One cannot commit evil in evil’, as Jean Genet once said. But that’s not a very satisfying answer. What I needed was a tactic. So I decided that everywhere I went I would offer to sell the book to people (and here I would hold up the pretty little book), or I would give it away as a text file (here I would hold up the flash memory stick on my key ring). A Hacker Manifesto could be both gift and commodity. You could buy it anywhere, at the chain stores even, or on the Internet, but if you wanted it free you had to get it directly from me, as a gift from one person to the other. Interestingly, I still sold lots of books. Sometimes the same people who copied it onto their flash memory also bought the bound and printed book. If I gave the text file away as a gift, I asked the recipient for an email address. I said they could give it to whomever they liked, but please don’t put the file on the Internet. I emailed the recipients later and thanked them for their interest. I’m still corresponding with some of them two years later. In short, I wanted to see if it was possible to have a gift economy that was personal, specific, localized in time and space, alongside the commodity economy. It’s related, I think, to the strange custom of signing books. People like to have the author sign the book. It adds a layer of gift to the commodity, particularly if the author dedicates the book to the recipient by name or adds a line specific to the encounter. This points back to an old belief about the nature of authorship. As culture philosopher and media theoretician Friedrich Kittler might say, it is about the mythology of the spirit animating the author’s pen. It seems somehow more contemporary to give the reader the text file. That’s the real working tool of the act of authoring these days. I made a conscious decision to give away text files and not pdfs. I hate pdfs! You can search them, but you can’t change them. They read poorly on the screen. They have too many of the artificial limitations of the book about them. Guy Debord once took all his films out of circulation. But in the era of the video copy, this came to look like a somewhat futile gesture. So later he decided to acknowledge that there may be screenings, but none of them would be authorized. This is the quality I like about giving away a text file. There’s no guarantee it is as the author left it. It is not authorized. It belongs to the reader, to do with as she pleases. Yes, the text can be a gift, but you have to ask. It’s personal. It’s not about law, its about making the social relation. Not copyright or copyleft, but copygift. This was the adventure: learning how a text can be a gift. So that was how I lived the contradiction: commodity and gift, thing and information, legal relation and social relation. If critical theory is not to become hypocritical theory, it has to get its hands dirty with these questions of form. Not just questions of the literary form of the text but also its legal form, its gift form, its technological form, its design form, and so on. Not ‘the death of the author.’ Not ‘the author as producer’. Not ‘there is nothing outside the text’. We need a new slogan. Or rather, no more slogans. Just new practices, hacking the work. We can refuse the distinction between reader / writer, consumer / producer, text / context. There is only and only ever the play of the work in progress. 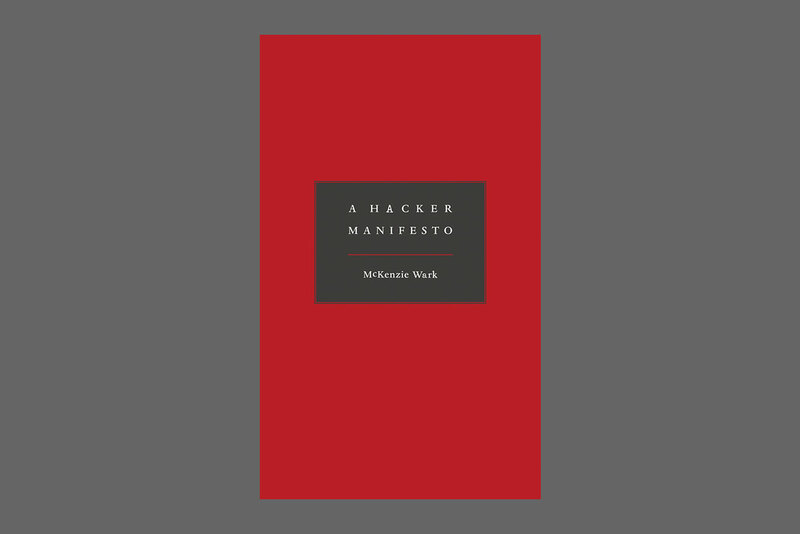 McKenzie Wark (USA) is a professor of cultural and media studies at Lang College, New School University and is author of A Hacker Manifesto (2004) and Gamer Theory (2007).